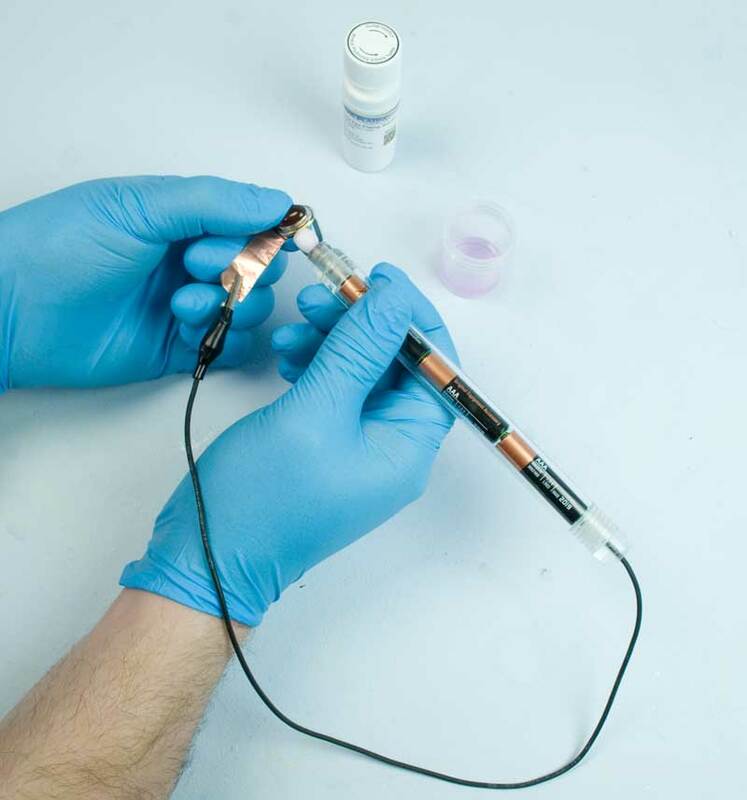 The Battery Powered Brush and Pen Plating kit gives you the flexibility of pen and brush plating, in one portable piece of kit. 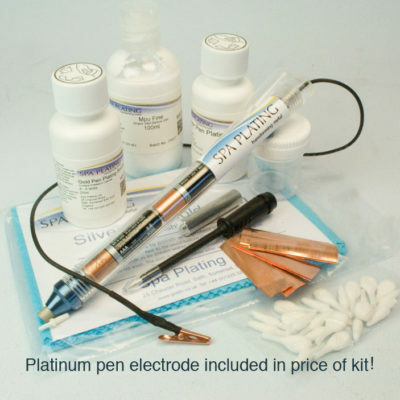 As well as the standard contents of our battery powered pen plating kit it also includes one of our short platinum electrodes, short swabs and 25ml of our gold brush plating solution. 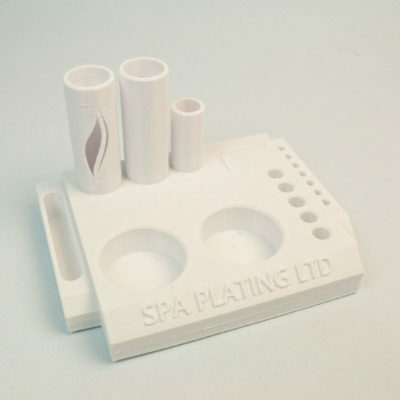 This allows you to brush plate larger areas such as rings, small items of silverware or coins as well as being able to selectively plate with the standard pen plating accessories included. 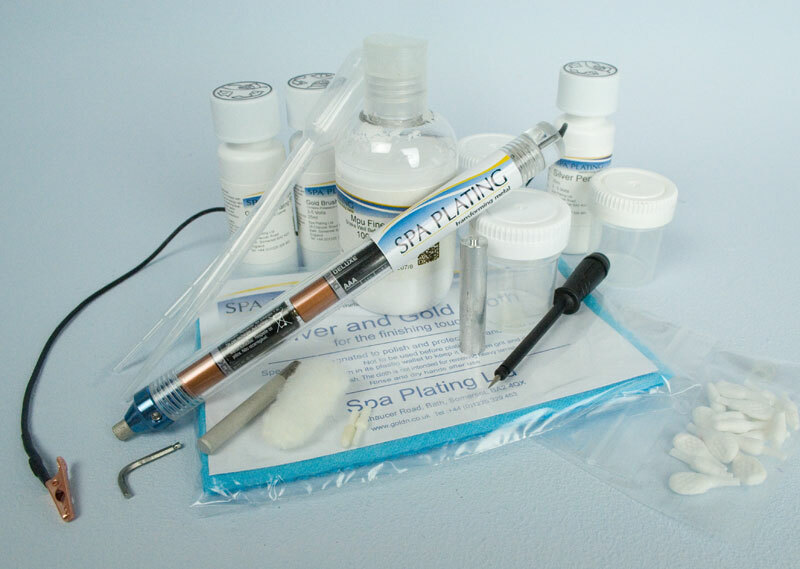 Can be used with our brush and pen plating solutions as well as our coloured metal mixers. This gold and silver pen plating kit is great for quick, selective gold plating jobs on jewellery. 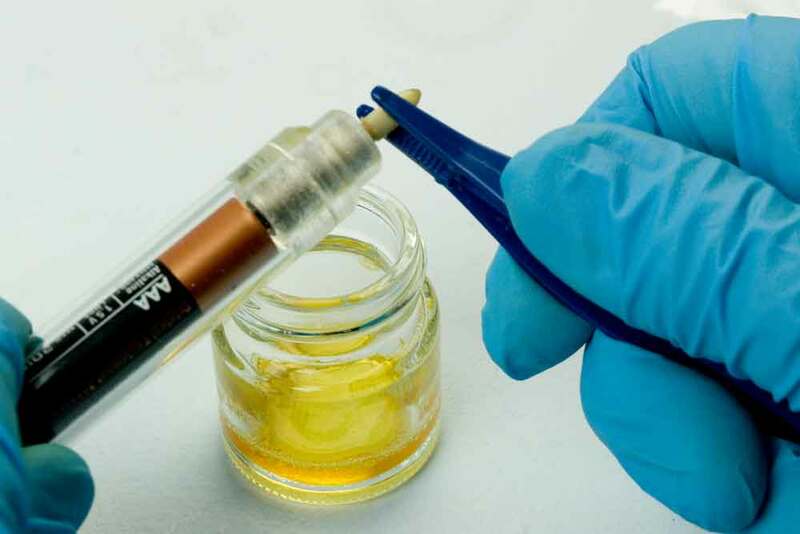 It includes 25ml of our Gold Pen Plating Solution which contains 12 grams of gold per litre and has been specifically developed in-house for our pen plating system. The nibs that are included in the kit can be used a number of times before they need to be replaced. We recommend specific nibs are used with specific plating solutions to avoid cross contamination. 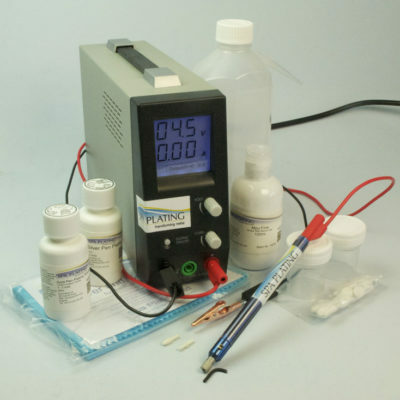 For more information on using our battery powered pen plating kit for pen plating, please click HERE to see the relevant product page. Please click on the ‘Video’ tab above for a demonstration. Powered by 3 AAA batteries Long life batteries that mean the plating pen will keep plating for longer. Delivers 3.0 – 5.0 volts. The batteries, once they are used up, can be easily replaced so the plating pen doesn’t have to be thrown away. 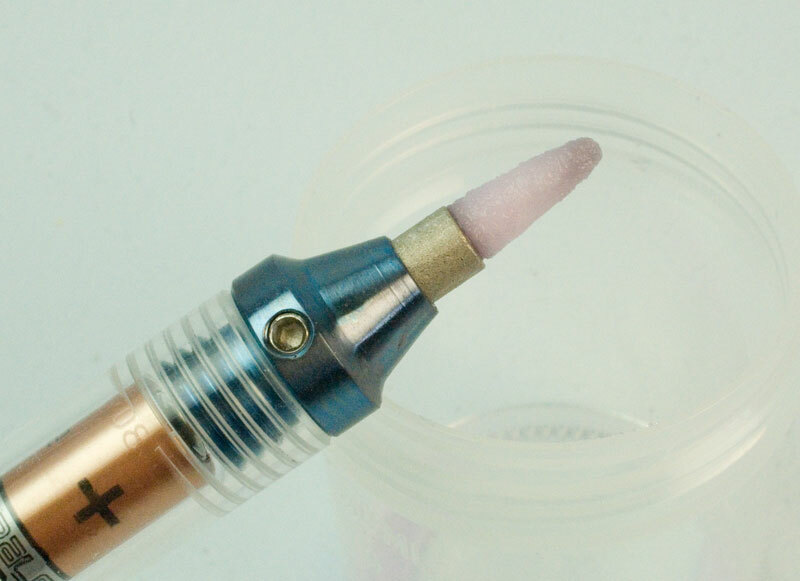 Pen electrode can be removed from pen electrode holder Can swap electrodes according to pen plating solution being used, so if you’re silver pen plating you can use our silver pen electrode or if you’re rose gold pen plating you can fit our carbon pen electrode. 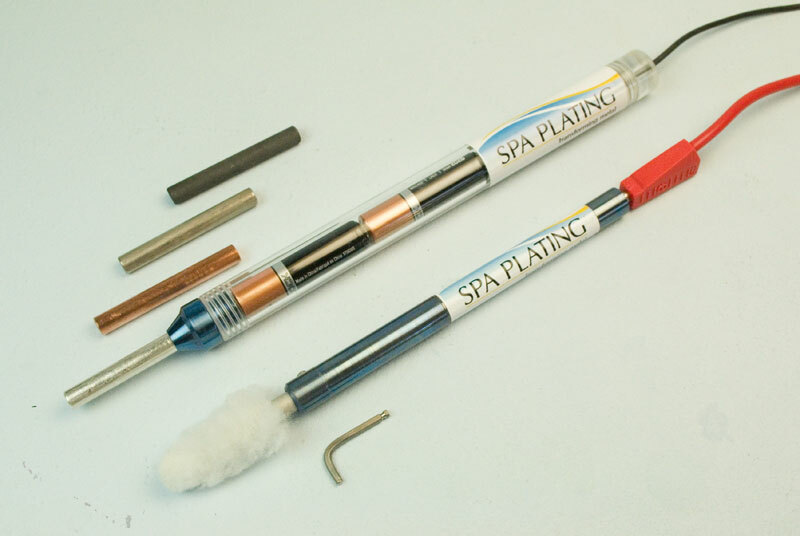 Can exchange pen electrode for our short platinum electrode for small scale brush plating. Just use the allen key included in the kit. Copper crocodile clip at end of black lead corrosion resistant and reduces scratching compared to a stainless steel crocodile clip. Great for selective gold pen plating on a range of different metals. Allows you to quickly switch between pen and brush plating when using the battery plating pen. 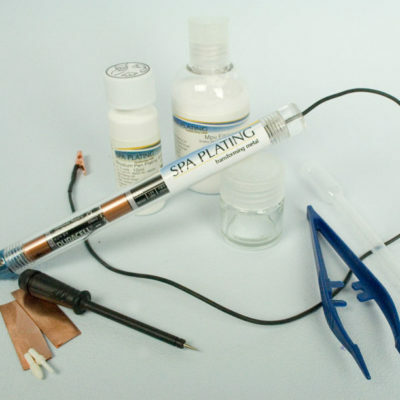 Fits the Short Platinum Electrode for brush plating with our battery powered plating pen. 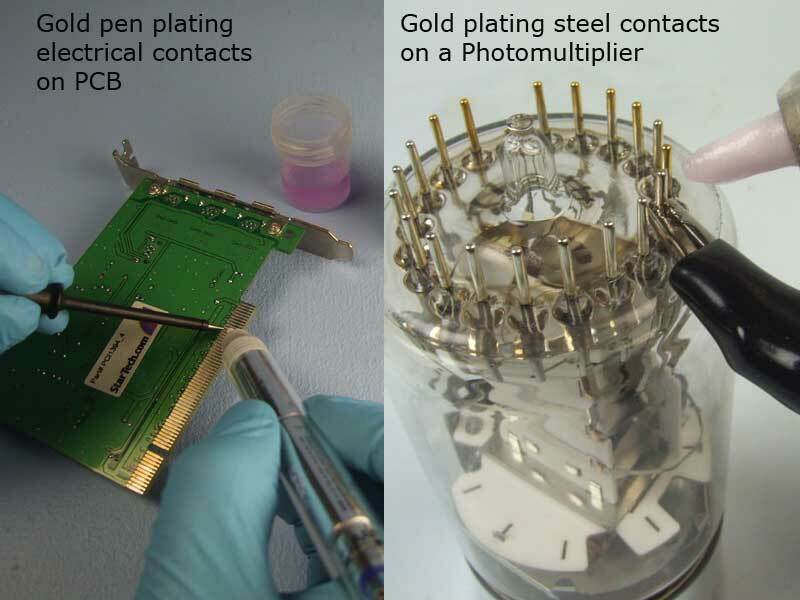 Economic option for precious metal brush plating as absorbs less plating solution. Gold concentration: 8 grams per litre. 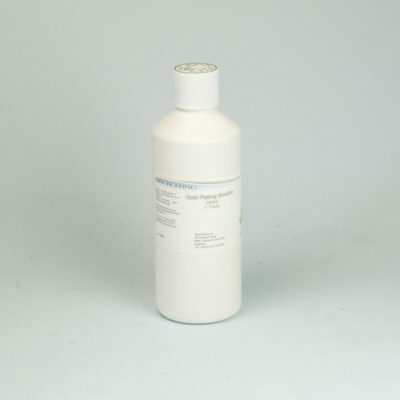 Ideal for plating personal items and functional applications such as electronics. 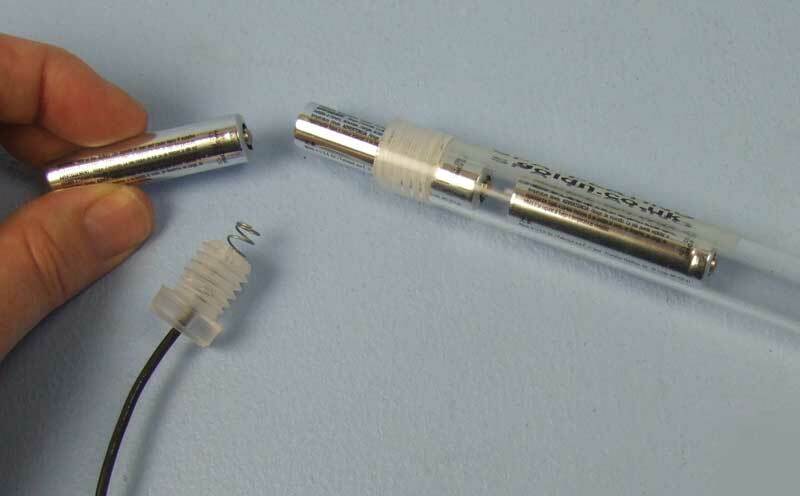 The battery pen can be adapted with the battery replacer to ensure high quality silver plating – please see description of battery replacer below. 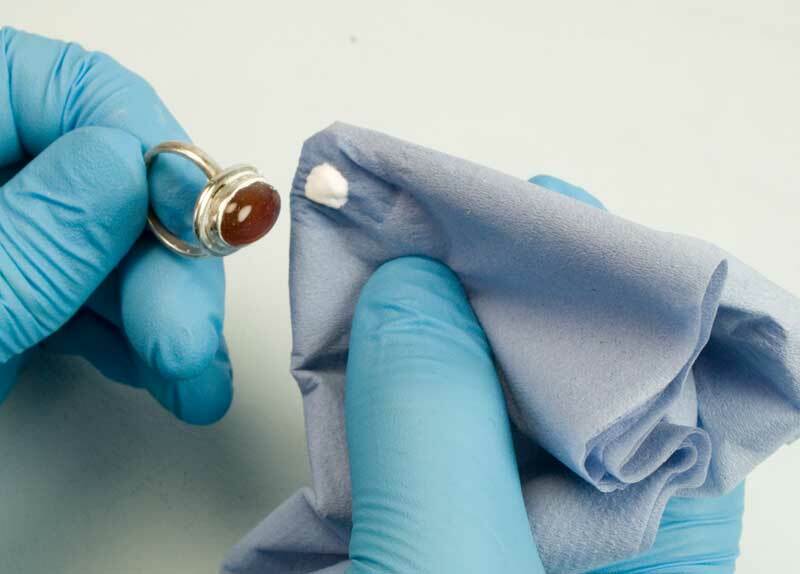 Cleans silver and gold plate A convenient way of keeping your silver and gold plated items in best condition. Comes in its own plastic pouch Keeps the cloth fee from dust and other particles, ready for instant use. 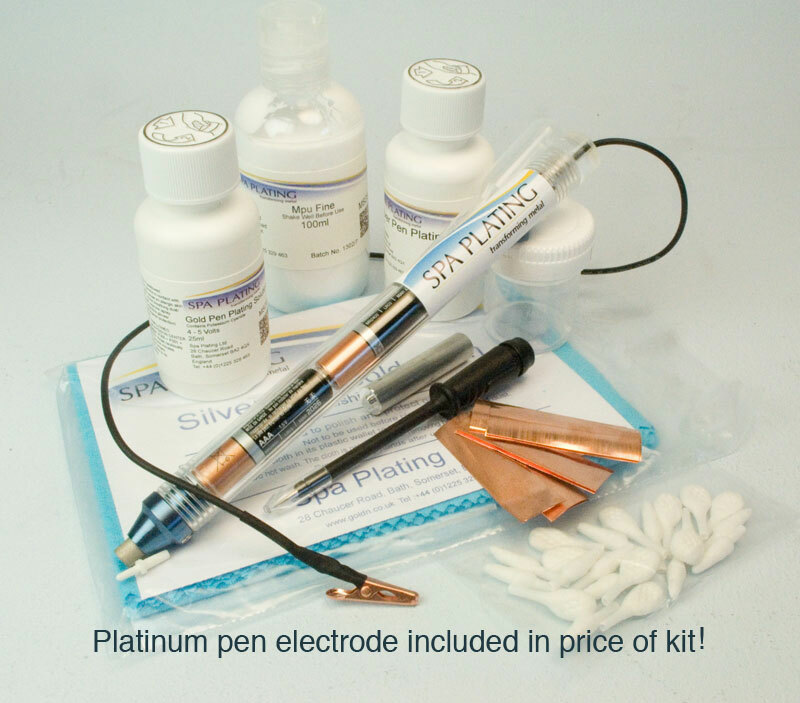 Our Battery Replacer reduces the voltage of our Battery Plating Pen to an optimal level for silver pen plating. See below for instructions on use. Reduces the voltage of our Battery Plating Pen to an optimal level for silver pen plating. Clips neatly into crocodile clip on battery pen Enables you to avoid any risk of scratching or marking your work with the crocodile clip. Much easier to grip small items with the Conductor Strip than the crocodile clip. 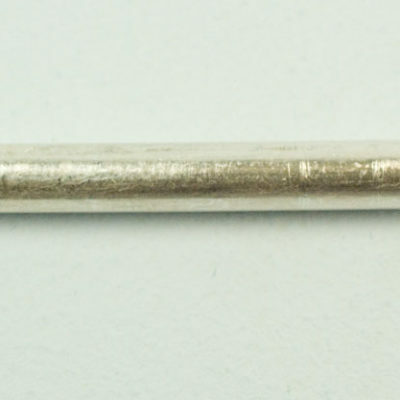 Two different shaped nibs, pointed and paddle very detailed spot plating such as electrical end connectors on PCBs and the paddle for plating larger surfaces such as rings. Can be used a number of times before they need to be replaced. We recommend specific nibs are used with specific plating solutions to avoid cross contamination. 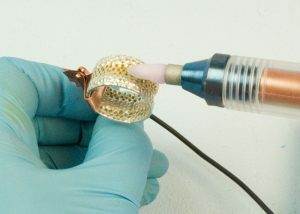 The Fine Fibre Nib has been specifically developed for rhodium plating claw and pave settings. The conduction band ensures good conductivity and optimum plating performance. 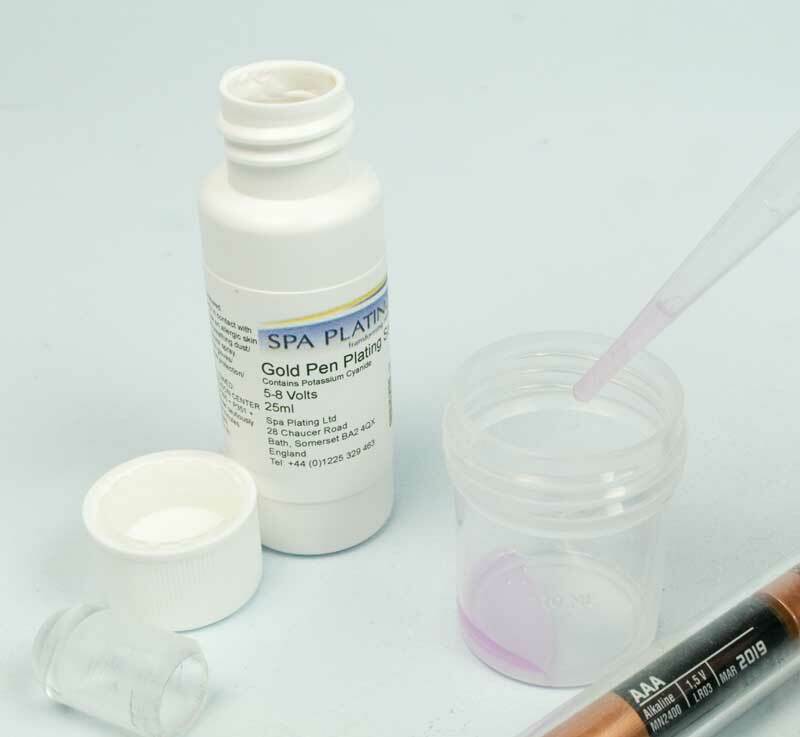 ultra fine nib absorbs less plating solution and is therefore more economic to use. Ultra fine steel contact Useful for making electrical contact with very small areas such as selective plating of jewellery and PCBs..